Getting An RV Loan? Can You Afford The Monthly Finance Payments? Can You Afford The Monthly Finance Payments? "Do Some Research Before Applying For An RV Loan"
You've checked your credit score and it's good and you're sure that you will be able to afford the monthly finance payments. No problem, right??????? Sure, a finance company will give you a loan for as much as you want (based on your credit). But, just because they are going to give you that much credit does not mean that you have to use that much credit. You might believe you can afford the monthly payments. But, you need to ask yourself if you can comfortably afford the monthly RV Loan payments and still have money left over to pay for the other costs of owning an RV.. I am not trying to rain (or drizzle) on your RV Loan parade here, but there are other expense factors that you may not have taken into consideration when you came to the conclusion that you can afford the monthly payments. Now grab a blank piece of paper and a pen or pencil (I prefer pencils, due to the attached eraser). Title the paper "Costs I need to add to my monthly RV Loan payment" On the first line of the paper put down the monthly payment amount that you thought you could afford. RV Insurance: You are going to have to insure your RV, whether it's a Tent Trailer or Class A Motorhome. If you know what type of RV you are going to get, you might want to look around and price insurance. Once you have that dollar amount, figure out what the monthly cost is and write it down on the next line of your paper. RV Emergency Road Service Plan: Some insurance policies include this in their coverage and some do not. Some RV Emergency Road Service Plans are better than others, that's why I personally use and recommend Good Sam Roadside Assistance. Learn More! Don't forget to write it down on your monthly cost sheet. License and Registration: Your going to have to renew this on a yearly basis, so put it in there, even if you are buying a new RV, you are going to have to renew eventually. Break it down to a monthly amount and YES, write it down. RV Maintenance: On a new RV, figure out how much it will cost for routine maintenance such as oil changes etc. For a used RV include the routine maintenance plus add more for unforeseen problems. Unforeseen problems include replacing the TV antenna that got torn off the top of the RV by a bridge, because you forgot to lower the antenna when you left the campground (yes, this happens all the time). You might want to make this monthly amount higher than you think it will actually be; to be on the safe side. Write it down (are you seeing a trend yet?). Depending on the age of the RV one option you might consider is purchasing an Extended Service Plan to cover unexpected repair costs. RV Storage: If the RV you buy is too large to store on your property or zoning ordinances in your area do not allow you to park your RV in a residential area, you will have to find an RV storage facility to store it when you are not using it (if you are planning to become a full time RVer, you can skip this part). I think you have the pattern down by now, so add the monthly cost to your sheet of paper (I won't remind you anymore). Accessories for the RV: If this is your first RV, you are going to have to buy essential supplies such as, bedding, towels, dishes, silverware pots, pans etc. Now you may have extras of some of these items in your house that you can permanently move to the RV but I guarantee that you will end up buying some new items as well. You're probably going to want things like a Portable BBQ to cook on while camping, Outdoor Carpet, Camping Chairs, Camping Tables, Flashlights and a string of those Pink Flamingo Lights that you can hang around your awning while at a campground. If you are just trading in one RV for another, you probably have a lot of this stuff already (except maybe the Pink Flamingo Lights). Please Note: All of the items above are reoccurring costs and can be easily broken down into a monthly amount. By the way, you have all this cost and you haven't even gone on a trip yet. If you are really enjoying breaking items down into a monthly RV Loan cost, you can break the items below down and add them in as well. So, What's Next? you ask timidly. To go camping of course. You did set some money aside to go RVing and Go Camping right? Unless you are planning an exciting camping adventure in your driveway, or the RV storage lot, you are going to need to spend some money to finally go RVing. Fuel: Yes, you are going to have to buy Diesel or Gas, to put in the RV or the tow vehicle for the RV. Propane: For cooking, heating and to run the refrigerator (when not on electric). Camping Fees: Unless you are planning to camp in Casino and/or WAL-MART parking lots, you are going to have pay to camp in a campground, state park, RV Resort etc. There are Discount Camping Clubs that can save you money on camping fees. Fun Money: This is the money you are going to use for whatever you want to do, such as amusement parks, restaurants and souvenirs (you just have to have that Mickey Mouse hat or that "I love Camping" sweater for your Chihuahua). 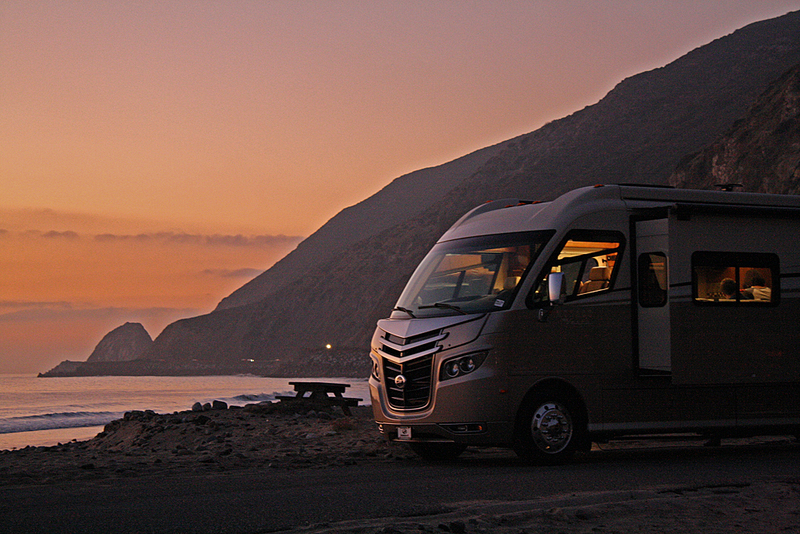 Once adding all of these expenses to your projected monthly RV loan payment, you will have a better idea of what you can comfortably afford to pay each month. If I have done My job right, I have prevented you from resorting to collecting aluminum cans from all the campgrounds you visit, just so you can make your next RV Loan payment (after all, that was my goal). You may be so frustrated after doing this exercise that you are asking yourself "Why do I even want to buy an RV"? You want to buy an RV because dollar for dollar, it is the most enjoyable as well as economical way to travel. You will spend less money in a month RVing than you would taking a conventional vacation and paying for airfare, hotel, rental car, food etc. Besides, you can see a lot more of the scenery at ground level than you can flying at 30,000 feet in the air. Once you have purchased your RV, you will have a chance to experience the RVing Lifestyle and I know just like me, you will love it. The memories you create by RVing will last you and your family a lifetime making the steps you had to take to get your RV worth the effort.